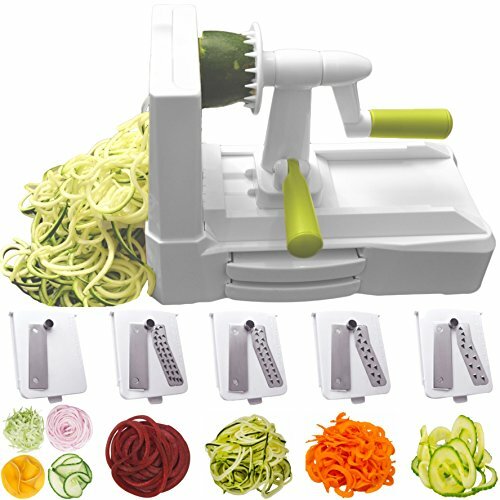 LET OUR QUALITY SPEAK FOR ITSELF: No expense was spared in making this the best quality spiralizer. 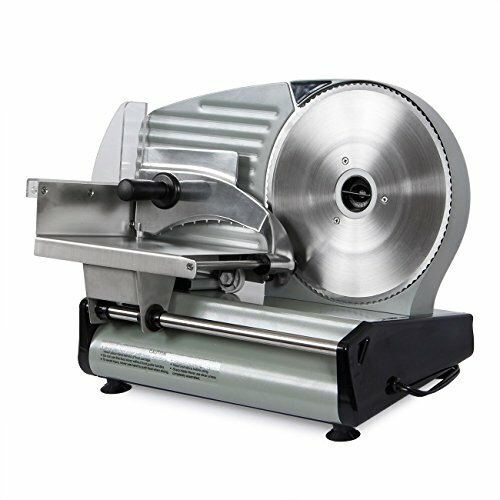 The 5 blades are made of Japanese 420-grade hardened stainless steel to ensure they will always stay ultra sharp. 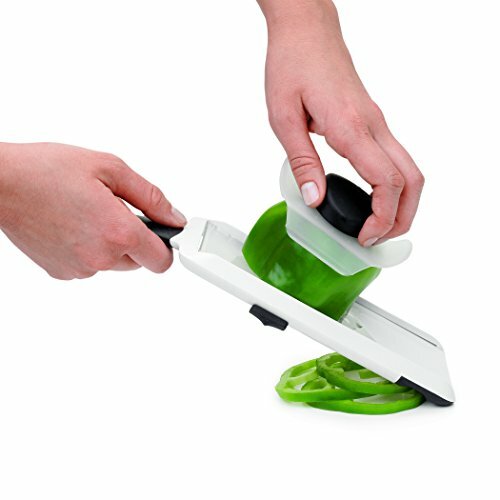 All plastic parts are made from 100% BPA-free food grade, durable reinforced ABS. The suction pad once locked will stay firmly secured to the countertop for hours. The handles are strong enough to withstand even the hardest of vegetables, such as butternut squash / sweet potatoes. WHAT MAKES IT DIFFERENT? 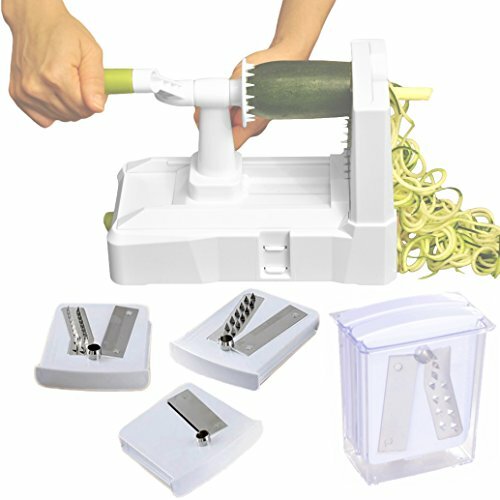 The 5 blades are designed to make a wide variety of cuts (2mm, 3mm, 5mm, 5.5mm and wide ribbon veggie noodles) | Large, foolproof suction pad with easy ON/OFF lever to keep the spiralizer steadfast during operation | Extra blade caddy for safe storage of blades – no more loose blades that can go missing or cause accidental injuries | Easy release mechanism of the blade rack for the most compact storage and transport | Designed to be dead easy to use, store and clean. 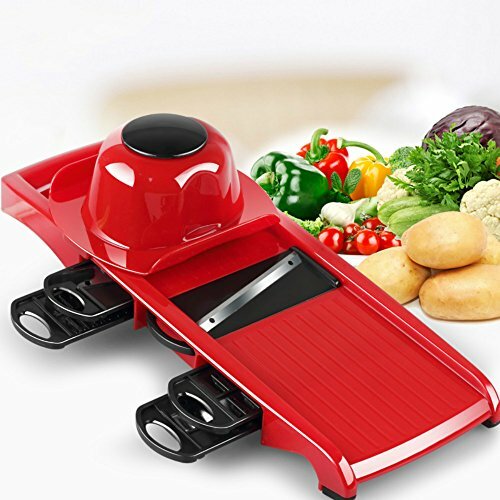 If you can find a Stronger, Heavier Duty product of this kind anywhere on Amazon, just show us the proof, and we will send you a 250% refund of your purchase price right away, no questions asked. 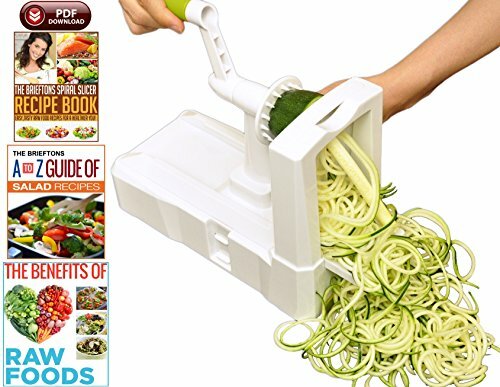 HIGHLY VERSATILE: Perfect for making quick low carb, healthy veggie noodles from firm fruits/veggies like apples, onions, carrots, zucchinis, cucumbers, cabbages, beetroots, turnips, rutabagas, cucumbers, radishes, potatoes, sweet potatoes, squashes, and more. 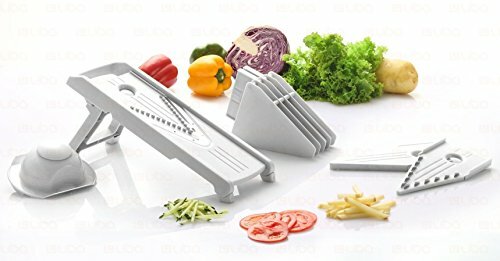 Works great even for long and wide vegs (max 10 inches long, 7 inches wide). Ideal substitute for Gefu Spirelli or Spiralfix, Joyce Chen, Benriner, WestMark, iPerfect, New and Essential, Veggetti, Kitchen Basics, Palermo spiralizers. HOW DOES IT HELP YOU? Enjoy your meal, even if you are on a diet (raw, vegan, low carb, gluten-free, no wheat, Paleo). 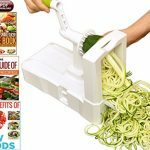 No more high carb pasta | A PERFECT GIFT FOR ALL OCCASIONS: What else can make a better gift for your loved ones than this gift of health | BUY WITH CONFIDENCE: We are the trusted spiralizer brand with thousands of happy customers. You are covered by our full unconditional money back guarantee if you are not happy with your spiralizer, when you order today!